Novice Agility continues where Beginning Agility left off. We will continue to develop teamwork and increase handling skills. Sequencing is performed off lead, therefore, your dog also must be able to sit, stay, down, and come on command, off lead. Handlers also further develop the ability to switch smoothly from handling their dogs off one side to handling off the other in the middle of a sequence using front, rear and blind crosses. The different come to side maneuvers will be practiced using obstacles. 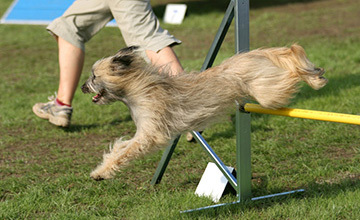 Dogs will be taught to move ahead and switch as needed from handler to obstacle focus. We will work more off leash doing short sequences of obstacles. Handling and agility skills such as front and rear crosses, reverse front cross, serpentines, 270s, get outs and threadles will be worked on to gain comfort and confidence. Course analysis to understand the best way to handle a combination of obstacles will be utilized.